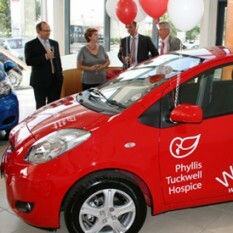 Fancy winning a brand new Toyota Yaris to help a local Hospice? 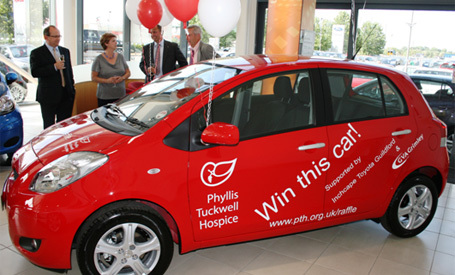 Local Entrepreneur Andrew Reynolds, a long time supporter and contributor to Phyllis Tuckwell Hospice, was on hand to the launch the latest fund raising initiative – the 2010 raffle which gives supporters the chance to win a 2010 registered Toyota Yaris in chilli red. This spicy little number will help raise much needed funds for the Hospice which cares for people affected by terminal illnesses in Guildford Fleet, Farnborough, Farnham, Aldershot, Cranleigh, Camberley and all of the towns in between. 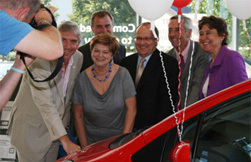 With the generous support of Inchcape Toyota Guildford, the car was purchased using donations from two Hospice supporters Andrew Reynolds and GVA Grimley Associate, Peter Robinson. In addition to the top prize, entrants will also be in the running for the second prize of £500 or third prize of £250. Raffle tickets cost £1 and are available from all of the Hospice’s charity shops across the catchment, from the Hospice itself. Andrew Reynolds said “There is no limit on the number of tickets you can buy. If you are able to sell tickets for the raffle at an event you are holding or a club you attend, please contact the Hospice. The draw will take place on Saturday 26 March 2011.